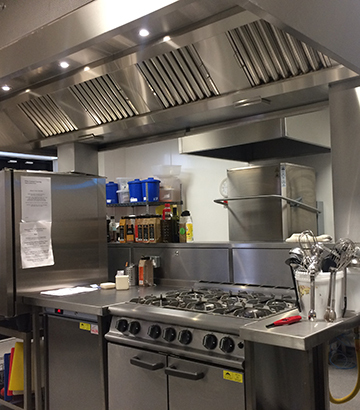 Our Airedale Ventilation Services division offers all clients in any sector with any canopy and the ancillaries associated with commercial catering kitchen ventilation systems and operations. Canopies, manufactured in 304 stainless steel, bespoke manufactured to the site’s exact requirements including Wall Mounted, Island Mounted, extract only, extract and input combined, induction, dishwasher extract and “Feature Canopies” as illustrated at our Gilpin Spice restaurant project. Extraction Systems, all of which are manufactured and installed in compliance with DW/144 Specification For Sheet Metal Ductwork and in accordance with TR/19 Heating & Ventilation Contractors Association Guide to Good Practice (Section 7) in relation to allowing access for cleaning and inspection purposes. Air Supply Systems, all of which are provided with filtration to prevent dirt or insects being drawn into a kitchen. Grease Removal. We offer the cutting edge technology grease removal system as well as a standard solution. Odour Control, the level of which is determined during the site surveys. Ultra violet and carbon filter cells are just a few products that we use to control odour. Noise Attenuation. We will work closely with a project’s acoustic engineers’ reports to provide the most appropriate attenuation. Gas Interlock Panels and Controls, which can be either built into the gas interlock system panel or more sophisticated panels that control the fans, gas interlock and heating. Service Distribution Units are also manufactured in 304 stainless steel and are bespoke made to suit the particular commercial catering kitchen. Electrical sockets back boxes can be welded at our factory. Fire Suppression Systems are often recommended and will be determined whether they are appropriate for the project during our site surveys . Additional items include stainless steel wall cladding, insulated screens and replacement Grease and Air filters. Please contact us today if you have any queries or we can assist you with your own project and look at the case studies below for the latest illustrations of our work.